A misfit bird travels the world to learn her special song…and to find her special place. Every morning the yellow songbirds sing their lovely song. 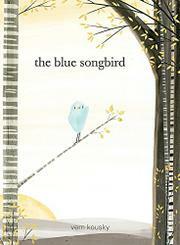 Their younger sister, the blue songbird, tries to join in, but her song is different. She shares her sadness with her mother, also blue, who tells her she must go and find a song only she can sing. The blue songbird flies away, first encountering a long-necked bird who identifies himself as Crane. Whooping, he advises the songbird to venture beyond the mountains, where the wisest bird lives. The blue songbird soars over peaks and valleys, reaching a dark forest and what looks like a wise old bird; he calls himself Owl. All he says is, “Who?” (albeit with great authority). The little blue bird continues her quest, crossing rivers and valleys, cities and oceans, asking every bird she meets for help. Then, finally, she alights on a golden island with three yellow birds on a branch and…her mother. She’s home! All her experiences make beautiful songs. Kousky’s watercolor illustrations have a delicacy that matches both his prose and his heroine, simply rendered with daubs of light blue onto which are painted a little beak and dots for eyes. The spare backgrounds and the delicacy of the landscapes recall Japanese watercolors.